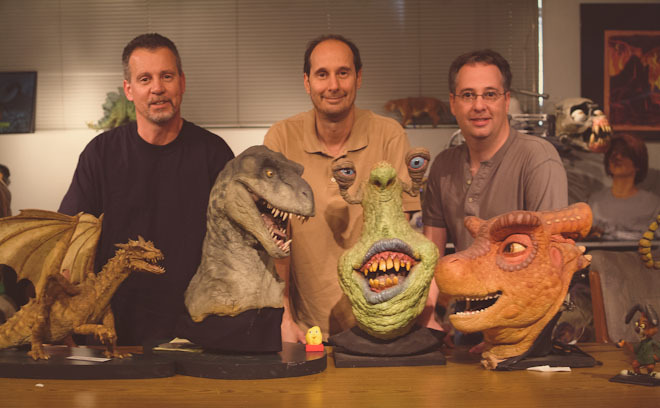 Charles, Stephen, and Edward Chiodo have spent over 20 years as a highly creative independent production company with expertise in live-action puppetry, stop-motion animation, prosthetics, make-up effects, special effects, costumes, and productions. Their dream started on Long Island, when the young trio began filming home movies. Over the years, Charles sharpened his artistic skills at the Pratt Institute and WABC-TV in New York; Stephen honed his animation and directorial talents at Rochester Institute of Technology, winning the Young Director’s Cup at the 1976 Cannes Film Festival; and Edward studied the art and business of film at Hofstra University. Shortly thereafter, the brothers combined their talents to create creatures and images for television and film. They have worked on film projects such as Robocop, Gremlins, Team America: World Police, Dinner for Schmucks, Pee-wee’s Big Adventure, Tales from the Hood, Good Burger, Elf, Screamers, Ernest Scared Stupid, Apt Pupil, Darkman, Sword and the Sorcerer, and the Critters franchise. Their television credits include multiple episodes of The Simpsons (2000-2001 Primetime Emmy Award), Frank Herbert’s Dune (2000-2001 Primetime Emmy Award), The Mr. Potato Head Show, Goosebumps, Days of our Lives, Weeds, Teenage Mutant Ninja Turtles: The Next Generation, Roseanne, and Thriller / The Making of Thriller (Grammy Award Winner for Best Video).